Cheese and beef tacos are an inexpensive, quick and easy-to-make dinner option. They can be high in calories, so if you're watching your weight, it's best to limit your portions. 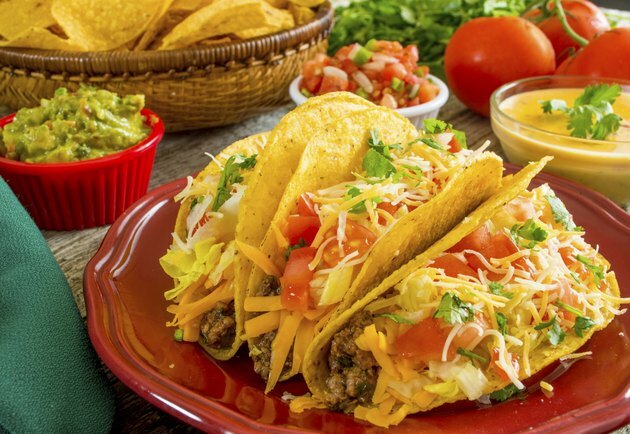 Cheese and beef tacos are typically made with corn tortilla shells, ground beef and cheddar cheese, and are topped with lettuce, tomatoes, salsa and sour cream. One taco made with a medium-sized taco shell, 2 oz. of 80-percent lean ground beef and 1 oz. of cheddar cheese contains 326 calories, or about 15 percent of the daily recommended intake for the average adult. The shell accounts for 59 calories, the beef for 153, and the cheese for 114. Beef and cheese are high in protein, an essential major nutrient. Beef also contains iron, which provides oxygen to your cells. Cheese is high in vitamin D, calcium and phosphorous, all of which are essential for the health of your bones. Refried beans, salsa and tomatoes contain few calories, but will add fiber, minerals and vitamins to your taco. One tbsp. of sour cream will add 23 calories. One beef and cheese taco contains 11 g of saturated fat and 22 total g of fat. Mayoclinic.com notes that less than 30 percent of your total calories should come from fat, and less than 10 percent should come from saturated fat. Excess saturated fat has been linked to high cholesterol and a higher risk of heart disease.